Time management is important for carers in any medical environment, so equipment needs to be designed to make everyday procedures as efficient as possible. The Chepstow Changing Trolley has been developed with this in mind, with three shelves for storage and a linen laundry bag to ensure everything needed is at hand during cleaning rounds. The easily manoeuvrable trolley helps to save carers both time and effort, making the bed changing process as efficient as possible. 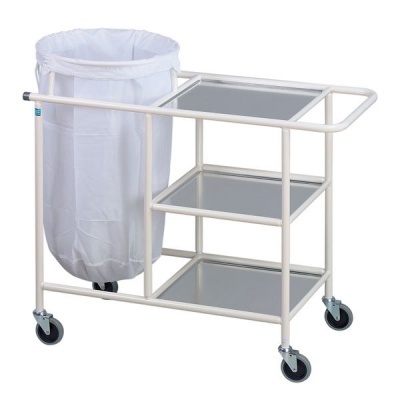 The trolley is designed for the professional environment (care homes, hospitals, hospices), and is sturdy and robust enough to withstand regular wear and tear. Made from a mild steel and coated in BioCote – an oxide antibacterial coating – the trolley is hygienic and easy to clean. This helps to reduce the spread of germs through cross-contamination within the hospital. This trolley consists of three shelves and a white linen bag. The shelves can be used for the storage and distribution of bed lining but are also removable for ease of use and individual preference. The bag holder securely holds the bag in place, even when full. To ensure the trolley is easy and smooth to move, the trolley consists of 5cm castors. These castors are larger than typical trolley wheels, allowing movement throughout the ward with little to no effort. This trolley is supplied with a white linen bag to make it easy to spot stains and discolouration. Additional laundry bags are available to buy separately in other colours. Please be advised that the Sidhil Chepstow Changing Trolley is usually delivered between 1 - 2 weeks of your order being placed. We would advise you to consider this delivery estimation before placing your order and apologise for any inconvenience that this may cause. For more information, please contact our Customer Care Team at 020 7501 0592.